The Halloween costumes are ready for a night of trick-or-treating. 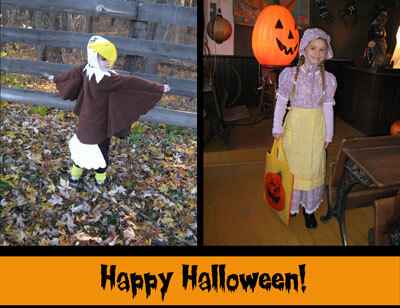 My daughter is dressing up as a Prairie Girl and my son's costume is a Bald Eagle (both hand sewn by me with a little help from my mom). I'm a big fan of homemade costumes because I think they make Halloween just a little more personal and special. One of my absolute favorite things about Halloween is seeing all the creative costumes. And one of the best things about children's Halloween picture books is the varied illustrations of creative costumes! But sometimes those costumes and the outdoor sights and sounds can be a little too scary ... then what? Jed Henry's fantastic watercolor illustrations in the new Halloween book Just Say Boo! show trick-or-treaters dressed as a bat, shark, witch and more, posed and ready to say "BOO!" to ward off everything scary. Spooky ghost decorations, howling wind in the trees, grim jack-o'lanterns -- kids can make them all less frightening by shouting BOO! 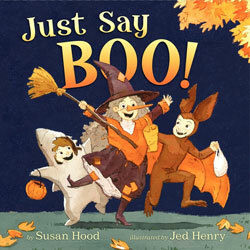 Henry's charming illustrations, combined with Susan Hood's playful text, show young children how to dispel their Halloween fears by making trick-or-treat time fun and silly. The call and answer format of the text makes the book a lively read-aloud and elicits numerous shouts of "BOO!" "If the ghosts in the trees wibble-wobble your knees, what do you say? .... BOO!" Best part of all (and something all parents will appreciate), Hood doesn't stop with just BOO. With a little prompt, she reminds kids that there are other things to say on Halloween, too, like the polite and ever important word, THANK YOU! Going trick-or-treating tonight? This is the perfect book to read beforehand. That sounds like a good book and I love the costumes that you made for your kids!